danke, dir auch schöne Feiertage! yes. after that came the ipernity update and I deleted all disposable pictures and threads to meet the upcoming 200 images limit for free accounts. I left easter and christmas/new year greetings online, though. 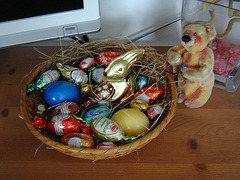 but actually there ARE some easter eggs still around!